Giraffes, Giraffa camelopardalis. Everybody loves giraffes – how could you not. Giraffes are such fantastic and unusual mammals that all manner of questions are still being asked about their anatomy, physiology and behaviour. A mild amount of controversy exists over how many neck vertebrae they have: the old chestnut about them having the same number of cervical verts as most other mammals  has been challenged by Solounias (1999), who proposes that they actually have 8. Why they have long necks remains contentious – personally I’ve become a fan of the sexual selection hypothesis championed by Simmons and Scheepers (1996) – and basic questions of anatomy, such as how their circulation works (Pedley et al. 1996) and why their bones differ in density from those of other artiodactyls (van Schalkwyk et al. 2004), remain interesting areas of research. As the only extant long-necked terrestrial tetrapods, giraffes are much employed in debates over the neck posture of sauropod dinosaurs, and recent articles by John Martin and colleagues (Martin et al. 1998), and Kent Stevens and J. M. Parrish (2005), discuss giraffes and what they might tell us about sauropod necks. Greg Paul has recently been saying a lot about giraffe necks on the dinosaur mailing list, but I haven’t yet read his comments, and I know at least two sauropod workers who have something in the pipeline on this subject. Something is happening in the world of giraffe research that will probably be unknown to dinosaur workers, and will affect the way in which giraffes are named in the literature. It’s no big deal, but it’s worth bringing to attention: it’s the species level taxonomy. Pretty soon, it’s no longer going to be ok to talk of your giraffe as being (necessarily) a Giraffa camelopardalis. Why? Because there are studies underway which indicate that more than one extant species is present. At least some of the observed variation is real (and not just individual variation, or clinal) – but how much of it, and what does it mean for taxonomy and phylogeny? Russell Seymour has recently been giving talks with titles like ‘How many giraffes? Temporo-spatial evolution in a "well-known" species and its implications for conservation of biodiversity’, so, reading between the lines, there is the implication that Giraffa camelopardalis is actually more than one species. Maybe one or more of the supposed subspecies is going to be elevated to species rank – or in fact restored to species rank, because at least some of the taxa were initially named as species, but later demoted when it became fashionable to lump big mammals in this way (and there’s an essay in that subject, by the way). A team involving Seymour, Rick Brenneman, David Brown, Thomas deMaar and Julian Fennessy are studying giraffe phylogeography, and their results should have bearing on this matter. Seymour has also been listed alongside Norman MacLeod and M. Bruford as looking at variation within Giraffa camelopardalis. I’ve seen Norman MacLeod listed as a coauthor on presentations regarding DAISY, an image-recognition software programme being developed at the NHM. Basically, they’ve developed software that can ‘look at’ and identify objects (including microfossils and bird bones) and, reading between the lines again, I wonder if it’s been applied to the distinctively patterned coats of giraffe subspecies? We’ll find out in due course. So far as I know nothing has yet been published on this – please let me know if you know otherwise. But, to those who are planning to mention giraffes in any of their writings, do keep this in mind: the giraffe you are thinking of may end up being something other than Giraffa camelopardalis. 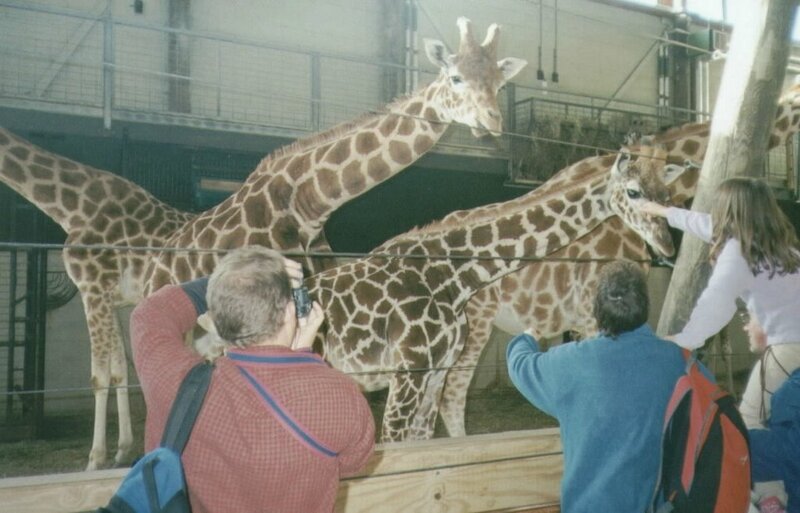 At top, the photo provides damning evidence for the assertion that the neutral neck posture of giraffes is a horizontal one (that was sort of meant to be a joke). Nick Longrich looks on, with camera. Dagg, A. I. 1962. The subspeciation of the giraffe. Journal of Mammalogy 43, 550-552. Martin, J., Martin-Rolland, V. & Frey, E. 1998. Not cranes or masts, but beams: the biomechanics of sauropod necks. Oryctos 1, 113-120. Pedley, T. J., Brook, B. S. & Seymour, R. S. 1996. Blood pressure and flow rate in the giraffe jugular vein. Philosophical Transactions of the Royal Society of London B 351, 855-866. Simmons, R. E. & Scheepers, L. 1996. Winning by a neck: sexual selection in the evolution of giraffe. The American Naturalist 148, 771-786. Solounias, N. 1999. The remarkable anatomy of the giraffe’s neck. Journal of Zoology 247, 257-268. Stevens, K. A. & Parrish, J. M. 2005. Neck posture, dentition and feeding strategies in Jurassic sauropod dinosaurs. In Tidwell, V. & Carpenter, K. (eds) Thunder-Lizards: The Sauropodomorph Dinosaurs. Indiana University Press (Bloomington & Indianapolis), pp. 212-232. I know this is an old post, but I just happened to find your site. I was at the Bronx Zoo in New York last week, and at the giraffe exhibit, the information plaque named only 3 subspecies. I can only assume that the differences in subspecies is somewhat debateable, and the opinion changes faster than the zoo can keep up with printing infomational plaques. Hi Katie. Unless the plaque is really, really old (like, Victorian), I doubt it's out of date. The currently recognised giraffe subspecies were named in the late 19th/early 20th centuries. Maybe the zoo just decided to simplify things. Good post, Darren; everyone love giraffes. I've only recently found you blog and am enjoying it very much. You certainly are getting a lot more blogging mileage out of you PhD than I am out of mine. As for getting a PhD, I've learnt that it's a total waste of time - - it does provide a good excuse to bum around at university for a few years though. Plus at parties you can introduce yourself with 'Hi, I'm the doctor'. Works every time. Hi im a year 9 studnt doing an essaay on giraffes and i cant find pics of a giraffes intestines and teeth and stuff can u help?